Kangaderoo Custom QR Code. 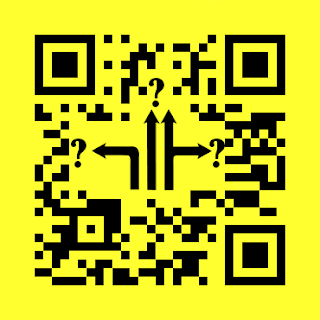 : What direction is your QR Code Heading? Quote from the movie Full Metal Jacket: "I think we should change direction." I started my company when I found out I could do something with QR Codes that was not yet offered on the internet. Having a product that stands out in any way from similar products is not enough however to generate sales. Most companies will tell you they sell wonderful products, but what are their clients buying? In the end they might buy your product, but basically they are looking for a solution. And as a marketeer it is more important to know what issues your clients have in order to generate the correct solution, then it is to push your off the shelf products. There is still some reluctance to use a QR Code in marketing campaigns. But why?? QR Codes should not be a hinder to your advertizing campaigns, they should solve problems. And for some problems they might be the ideal solution! You want to offer specific product information. The link to this information is deeply nested on my website, no-one would type the long URL on a mobile device. You want to track the effectiveness of one particular campaign that is printed in a magazine. You want to measure if you target the correct audience, based on location, age, gender, etc. The last years we can observe a shift in internet usage from desktop use to mobile use. A lot of internet based information related to your campaign effectiveness is freely available, it just needs to be harvested. And with the use of QR Codes you can bridge printed material to (mobile) internet perfectly and at very low cost. And with companies, like my own, that graphically enhance the appearance of the QR Code, this bridge can be seamlessly integrated and even enhance your advertizements. Just as all the other marketing aspect that are in play when running a campaign, it does not happen overnight and will not run by itself. If your current campaign, either with or without QR Codes, is not generating the expected results, check if you are still heading in the right direction.